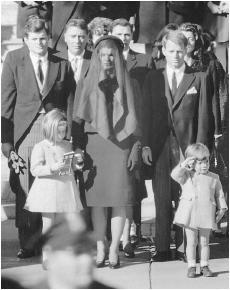 This popular image of the Kennedy family taken during John F. Kennedy's funeral shows John Jr. paying tribute to his father with a salute. develop. Children's play has included death-themed games in many societies throughout the centuries. One of the most common games is tag and its numerous variations. The child who is "It" is licensed to chase and terrorize the others. The touch of "It" claims a victim. In some versions the victim must freeze until rescued by one of those still untouched by "It." The death-related implications are sometimes close to the surface, as in a Sicilian version in which a child plays dead and then springs up to catch one of the "mourners." One of the most elaborate forms was cultivated in the fourteenth century as children had to cope with the horrors of the Black Death, one of the most lethal epidemics in all of human history. "Ring-around-the-rosy . . . All fall down!" was performed as a slow circle dance in which one participant after another would drop to the earth. Far from being innocently oblivious to death, these children had discovered a way of both acknowledging death and making it conform to the rules of their own little game.